When AppRemover was first published in 2009 I reviewed it and came to the conclusion that it was a great software for users who had troubles removing security software like antivirus, anti-malware or firewalls from their Windows operating system. Two years later and the application is still around. The development company OPSWAT has improved and maintained the application in that time, more about that later. AppRemover is designed to give users a reliable option of removing security software from that system. It is for instance helpful if the default uninstaller is not working correctly, if you suspect file and Registry leftovers after uninstallation or if a program is acting up and you need to remove it completely from the system. The list of supported vendors and products has been improved significantly in the last two years. New products such as Microsoft's Security Essentials, latest 2010 and 2011 editions of security suites and other security related products are now supported by the software uninstaller. 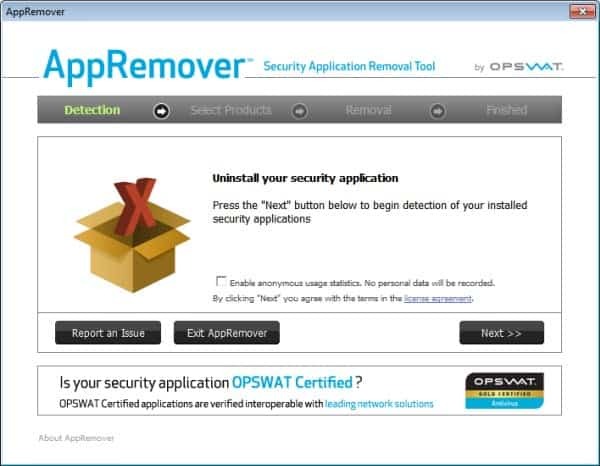 Software companies supported by AppRemover include Symantec, McAfee, AVG, Avira and Trend Micro. You find an up to date list of all supported applications here on the product website. When you first start AppRemover, a portable application by the way, you get the option to remove installed security applications or to clean up failed uninstalls of security software on the system. The first option works much like a standard program uninstallation, the second will crawl folders and the Registry to find and remove leftovers. The program will scan the system and display a list of found applications, application leftovers depending on the user's choice. You are then presented with a list of applications discovered. You can select none, one or multiple applications that you want to remove from the system. A reboot of the computer system may be required after the removal process. The program supports more applications and developers which is a good thing. There are two things missing that I'd like to point out. It first lacks a backup and restore option which some users may want to avoid removing the wrong programs or files from the system. The second missing feature is the ability to find leftovers of programs that the initial system scan did not detect. 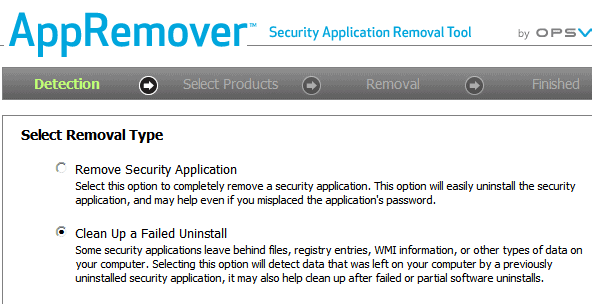 Windows users can download AppRemover from the official program website. The software is compatible with all recent 32-bit and 64-bit editions of the operating system. It seems to run in an IE wrapper, which is a bit weird. The list of applications supported include very old and not up-to-date versions.